Dolly wrapped up the first segment of her Pure & Simple Tour on Tuesday night in Pittsburgh, Pa., ending the first three-and-a-half-week, 16-city leg of the North American tour. She now has three weeks off before picking up the second leg of the tour on July 19 in Cedar Rapids, Iowa. That segment has 17 cities across three-and-a-half weeks and will be followed by two final legs (September-October, for which 16 dates have been announced, and November-December, for which eight dates have been announced, with more to come). Last Wednesday's Wilkes-Barre, Pa., show (which included little bits of "Little Tiny Tassletop," "Puppy Love," the "Black Draught Theme" and "Dumb Blond") was reviewed in The Citizens Voice here and The Weekender here. Saturday's Pride weekend show in Queens, New York City, garnered preview interviews with The New York Times here (where they asked for her opinion on Hillary Clinton) and New York Post here (where she tells the story of being mistaken for a prostitute in New York), a photo gallery of concertgoers from New York Magazine here and reviews from Jezebel here, US 99.5 here, The Digital Journal here and London's The Guardian here. Sunday's concert across the bay in New Jersey was reviewed by New Jersey.com here, with some video of the performance loaded to YouTube here. And The Bangor Daily News followed up with the photographer who captured Dolly in concert when she was starting with Porter Wagoner and they came to that city nearly 50 years ago who got to meet her when she returned to the city on this tour here. This week's Box Score from Billboard magazine lists the ticket sales information from the second show to be reported from Dolly's Pure & Simple Tour: June 21 in Boston. The show sold 85 percent of the 3,561 available seats and grossed $386,609 to rank as the week's 41st largest-grossing concert worldwide. Elsewhere on the charts, Don Henley's Cass County, featuring the Dolly duet "When I Stop Dreaming," re-enters the Billboard country album charts at No. 43 for a 36th week on the tally dated July 9. Overseas, Dolly's The Tour Collection falls back out of the top 20 on this week's U.K. country compilation albums tally, it was revealed Friday, down from No. 19. On the same chart, Emmylou Harris' Original Album Series, Volume 1 (with two Dolly covers, one track with Dolly harmony and one track with Trio harmony by Dolly and Linda Ronstadt) also falls of the top 20, down from No. 15, but her Original Album Series, Vol. 2 (featuring one track with Dolly harmony and two tracks with Trio harmony) slips three to No. 10, while Ronstadt's own Original Album Series (featuring one Dolly cover and one track with Dolly harmony) re-enters the top 20 at No. 18. Variety on Tuesday reported that Disney actress Kelli Berglund will replace Carson Chapman Meyer in the role of Dolly's sister Willadeene in this winter's sequel to Dolly Parton's Coat Of Many Colors on NBC: Dolly Parton's Christmas of Many Colors: Circle Of Love. Read more here. The recent import concert release Country Girl In The Big Apple CD from her 1977 pop "coming out" concert at New York's Bottom Line this week got a vinyl release. Reserve your copy here. Also, the cover art for the vinyl version of the The Complete Trio Collection Deluxe's bonus material, Farther Along, coming out Sept. 9, was released this week. Check out the artwork at left and order your copy here. Longtime Dollywood entertainer Steve French, co-founder, longtime emcee and longtime baritone singer with the Kingdom Heirs, has passed away, Southern Gospel News Scoops reports here. French had retired at the end of the 2014 season at the age of 55 after 33 years of performing with the group. A third Texas date was added Wednesday to Dolly's Pure & Simple Tour: Dec. 8 at San Antonio's Tobin Center for the Performing Arts as a fundraiser for The Tobin Center's Generation NEXT Education Initiative. Tickets go on sale via the venue's website at 10 a.m. Friday. Dolly is the third annual headliner for the fundraiser, following Paul McCartney and Lionel Richie. In related news, The Boston Globe reviewed her Tuesday night show in the city here and New York Newsday previewed her Saturday engagement in the Big Apple here. Just three days after shutting down for a mechanical part recall, Dollywood has reopened the world's fastest wooden roller coaster, Lightning Rod. Read more from Travel And Leisure here. A screening for Emmy and Screen Actors Guild voters to see Dolly Parton's Coat Of Many Colors took place this week. Dolly could not attend due to her tour but sent an introductory video available here and in the media player above, while the film's cast held a Q&A with awards-watchers Gold Derby viewable here or in the media player below. Ticketmaster on Tuesday released the list of more than 400 upcoming shows that those who purchased past tickets through the sales website and are subject to a class action lawsuit settlement may attend for free, and one Dolly date appeared on the tally: her Sept. 24 engagement at Mountain View, Calif.'s, Shoreline Amphitheatre. The free ticket vouchers are good only at Live Nation-owned venues for general admission areas at select shows. In related news, her New York City show on Saturday is previewed in AM NY with a brief interview here and a columnist who attended her Atlanta concert recalled it in The Albany Herald here. Get TV has scheduled a marathon of the 1976-77 variety series Dolly! to air on Independence Day. Six back-to-back episodes start at 8 p.m. Eastern with Tennessee Ernie Ford, Kenny Rogers, Linda Ronstadt and Emmylou Harris, Anne Murray, Lynn Anderson and the Parton Family, with the marathon repeating starting at 11 p.m.
Dolly Parton's Coat Of Many Colors has been accepted for up to 14 Emmy Award nominations in 13 different categories, according to the initial ballots from the Academy of Television Arts and Sciences. "Little Dolly" Alyvia Alyn Lind is up for Outstanding Lead Actress In A Limited Series Or Movie, "Wiladeene" Carson Chapman Meyer and "Avie Lee Parton" Jennifer Nettles are up for Outstanding Supporting Actress In A Limited Series Or Movie and "Robert Lee Parton" Ricky Schroder is up for Outstanding Supporting Actor In A Limited Series Or Movie. The film is one of 24 being considered for Outstanding Television Movie and is also eligible for Outstanding Production Design For A Narrative Period Program (One Hour Or More); Outstanding Casting For A Limited Series, Movie Or Special; Outstanding Cinematography For A Limited Series Or Movie; Outstanding Costumes For A Period/Fantasy Series, Limited Series Or Movie; Outstanding Directing For A Limited Series, Movie Or Dramatic Special; Outstanding Single-Camera Picture Editing For A Limited Series Or Movie; Outstanding Sound Editing For A Limited Series, Movie Or Special; Outstanding Sound Mixing For A Limited Series Or Movie; and Outstanding Writing For A Limited Series, Movie Or Dramatic Special. Final nominations will be announced July 14 and winners will be revealed Sept. 18. Nettles spoke this week with award watching blog Gold Derby here about the project. Dolly's Pure & Simple Tour on Monday added two more shows: Nov. 18 at the North Charleston Coliseum in North Charleston, S.C., and Dec. 6 at the Frank Erwin Center in Austin, Texas. Seats for South Carolina go on media/venue/promoter presale at 10 a.m. Eastern Thursday with public sales starting at noon Friday via Ticketmaster, while the Austin show also goes on sale at noon Friday but through TexasBoxOffice.com. (And although some members of the Austin media are reporting it is the only Texas date announced for the tour at this time, Dollymania.net confirmed and reported her Dec. 3 concert in Dallas on Friday night.) In other ticket news, her Sept. l2 Winnipeg show, which Dollymania.net was also the first media outlet to report on nearly two weeks ago, revealed its ticket information on Monday at Ticketmaster, which began selling American Express presale seats and VIP packages at noon Central time that day. This will be followed by a Live Nation mobile app presale at 10 a.m. Wednesday with public sales starting 10 a.m. Thursday. The final gallery of Dollymania photos from her recent stop in Cincinnati have been added to that section of the site here. CNBC posted the complete first half of its CNBC Meets interview with Dolly after releasing a couple of excerpts a few weeks ago. Watch it here. And check out coverage of Friday night's Lenox, Mass., show from Mass Live here, The Times Union here, The Berkshire Eagle here and The Boston Globe here and of Saturday's Bangor, Maine, engagement from The Portland Press Herald here, Culture Shock here and WABI here. Finally, Newsworks offered a wonderful column of watching Dolly's Philadelphia show through the eyes of someone after the Orlando shooting and seeing the potential for a unified America, noting: "Thank you, Dolly Parton, for giving America something to be proud of.�Thank you for reminding me that there is love and light and inarticulable beauty in the world." Read more here. The tour next moves to Boston Tuesday night, Wilkes-Barre, Pa., on Wednesday and the New York City area Saturday and Sunday with performances in Queens, New York, and across the bay in Holmdel, N.J.
Days after officially opening (and four weeks after members of the public could first start riding it on a "test" basis), Dollywood's $22 million Lightning Rod, the world's fastest wooden roller coaster and first launched wooden coaster, shut down over the weekend due to its manufacturer issuing a recall on a part. According to Theme Park Insider, the part is a hydraulic cylinder in the restraint system and should take about a week to replace. The closure caught the attention of USA Today here. The first information about how well a concert on Dolly's Pure & Simple Tour has done came out this week. Billboard's Boxscore this week listed her June 4 Atlanta-area date as the 49th highest-grossing concert of the weekly reporting period. The show sold out all 8,175 tickets that were available and grossed $746,735. In other developments, another winter leg date on the tour has been announced: Dec. 3 in the Dallas area: the Verizon Theatre in Grand Prairie, Texas, a venue she last played in 2011. Tickets go on sale at 10 a.m. Central time Aug. 26 via axs.com. Critics loved her show Wednesday in Philadelphia with rave reviews from The Morning Call here and The Philadelphia Inquirer here. Thanks to reader Christine Ford for sending in some shots from the concert here. Also, an additional gallery of Dollymania.net images from Cincinnati has been added to that section of the site here (more to come!). The tour went to Lenox, Mass., on Friday before heading to Bangor, Maine, on Saturday (WABI updated the story on a photographer who took her picture when she last performed there 40 years ago and wanted to see her again � he'll get to meet her backstage � read more here) and Boston on Wednesday. Dolly's The Tour Collection re-enters the top 20 on this week's U.K. country compilation albums tally, it was revealed Friday, coming in at No. 19. On the same chart, Emmylou Harris' Original Album Series, Volume 1 (with two Dolly covers, one track with Dolly harmony and one track with Trio harmony by Dolly and Linda Ronstadt) inches up one spot to No. 15, and her Original Album Series, Vol. 2 (featuring one track with Dolly harmony and two tracks with Trio harmony) re-enters the top 20 at No. 16, while Ronstadt's own Original Album Series (featuring one Dolly cover and one track with Dolly harmony) falls back out of the top 20, down from No. 20. Dollywood on Wednesday started season passholder presales for Dolly's Pure & Simple Tour in Pigeon Forge on Nov. 15 to benefit her Imagination Library but the sales greatly frustrated fans for hours. Many complained the online ticket sales platform would not recognize their season passes, requiring them to call for tickets, which overwhelmed the phone systems for the park. (Your webmaster can confirm that neither our family's platinum pass nor regular park pass could access tickets online � twice the error message came back that the passes were not valid but over 100 times the message just said that an error had occurred, most likely a time-out error given how long the site was taking to load, indicating it was operating beyond its capacity just like the phone. Your webmaster can also confirm that more than 100 phone calls between 10 a.m. and 12:30 p.m. resulted in "all circuits are busy" messages, while calls between 12:30 p.m. and 1:30 p.m. went through but resulted in an outgoing message that calls were not being accepted at that time because all operators were returning call-backs from earlier in the day. I finally got through on the phone at 2 p.m. and waited half an hour to talk to someone. Four and a half hours after tickets went on sale, I was offered four sixth row seats, suggesting that by that time very few tickets had actually been sold. Monitoring Facebook postings, I have yet to see anyone who was able to complete a ticket purchase using the website.) The park kept phone lines operating through 8 p.m. to try and accommodate calls. Its Facebook page included the following message about an hour after tickets were supposed to be on sale: "We apologize for any inconvenience you may have experienced purchasing tickets this morning. If you are a 2016 Dollywood Season Passholder, you may now visit�http://bit.ly/23aeywf�to purchase tickets to Dolly Parton's Pure & Simple concert on Nov. 15 in Pigeon Forge." The message was later updated to add: "We apologize for your frustration regarding the purchase of tickets to Dolly's Pure & Simple concert in Pigeon Forge. Based on high demand, we are extending Dollywood's Call Center hours until 8 p.m. EST tonight." The problems were so severe that many local media outlets reported on it: The Mountain Press here, Sevier News Messenger here, The Knoxville News Sentinel here and WATE here. Don't forget tickets for Dolly's Nov. 15 Pigeon Forge concert to support her Imagination Library go on sale at 10 a.m. Wednesday for Dollywood season passholders here or by calling 1-800-Dollywood. They become available to the general public on July 1. Her recent Wolf Trap concert is reviewed by Glide magazine here. 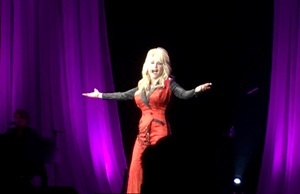 And your official Dollymania.net photo galleries from Saturday's Cincinnati concert have begun here. Don Henley's Cass County, featuring the Dolly duet "When I Stop Dreaming," this week re-entered the Billboard charts, it was revealed Tuesday. On the June 25 tallies, the CD re-enters the top 50 country albums list at No. 49 for a 35th week and debuts on the 25-position Americana/folk albums chart at No. 25. Dolly on Monday hopped across the border to Toronto to host a press conference on a wide range of topics to promote the Canadian leg of her Pure & Simple Tour. Among the tidbits were that the album of the same name (cover art for which was released on Monday and is posted at left) will be distributed by Sony Music worldwide for Dolly Records, that its release date has been moved up by one week to Aug. 19, that the track listing is still being finalized even though a track listing appears in the tour books, that the title track will be a single and that "I'm Standing Outside Your Door" may be the second single. Also at the conference, she was asked about Sunday's terrorist attack in Orlando, replying: "I do have big gay following, and I'm the patron saint to a lot of those guys and it makes me feel good. But as far as�what happened in Orlando, that's just horrible. It doesn't matter what kind of a club it happened to be. It's a hate crime, looks to me like what they say. I am not God, I am no judge, I just know that God loves us all. It's just terrible that people kill anybody for any reason. But the fact that you just kill somebody for being something you don't agree with or don't understand is terrible. It's just terrible, period. We should love one another a little, don't you think?" She was also asked about North Carolina's anti-LGB and anti-trans legislation, responding: "I think we all have to live in this world and we're all kinds of people. I think everybody should be protected, everybody should be safe, everybody should be comfortable in their world however they do. So I really think it's important that we as a nation, we as a people, try and love each other a little better and try and love each other a little more. It's nothing to be flippant about in any way but I always say we had the first transgender bathroom in our outhouse back home. And I always joke our water park at Dollywood � everybody's free to pee in that. But the point is I think we need to make better rules. We've got to take better care of each other." Coverage of the press conference include Hello Magazine here, The Toronto Star here, The Knoxville News-Sentinel here and Billboard here. In related news, reviews of her Sunday show in upstate New York appeared in The Niagara Gazette here and The Buffalo News here, while Saturday engagement at Cincinnati made Cinci Music here. Also, The New York Times noted here that her tour includes two dog to sniff out explosives and keep her safe on the road. Finally, Winstar World Casino and Resort in Thackerville, Okla., announced Monday that she'll perform two nights at their establishment Dec. 9 and 10, with sales starting at 10 a.m. June 17. Learn more here. Three weeks after they started offering limited ride previews during the testing phase and nearly three months after it was supposed to originally open, Lightning Rod officially opened on Monday at Dollywood. The $22 million addition is the world's first launched wooden coaster and world's fastest wooden coaster. In a press release, Dolly said: "I knew we really had something truly special when we started talking about building Lightning Rod. It's going to bring people from all over the world to Dollywood so they can experience all that speed and excitement. I just can't wait to hear what everyone thinks when they burn rubber on that wild ride through the hills in our newest hot rod! I know one thing; it's definitely going to flip your wig!" The story was covered by the Knoxville News-Sentinel here. The park on Saturday also kicked off its Great American Summer, featuring 10 a.m.-10 p.m. hours concluding with a nightly fireworks show. Headliners are illusionist Brad Ross for the first half of the festival and the Stunt Dog Experience for the second half. Also returning is "The Little Engine Playhouse" with "Old Bear and His Cub" and "Betty Bunny Didn't Do It." Dolly put on an amazing show Saturday night in Cincinnati, Ohio, at the newly-renamed Jack Casino (formerly the Horseshoe), providing one of the most intimate audiences on her Pure & Simple Tour (the capacity is just under 2,000) her full set list of the tour, including "Applejack," "Precious Memories" and "Hello God"/"He's Alive" (songs which have been absent from some of the dates on the tour). She was in top form and the audience ate it up. The first half of the show had the crowd quietly enthralled with the more folksy and bluegrass-inspired numbers, transitioning to a rousing sing-a-long for her medley of protest songs, then a true party atmosphere for the more pop period second half. The venue posted the above video of the three opening songs to its Facebook page here, and local TV station WCPO shared a photo gallery here. She then headed to Lewiston, N.Y., outside of Niagara Falls on Sunday and next moves to Philadelphia on Wednesday, Lenox, Mass., on Friday and Bangor, Maine, on Saturday (where a local photographer hopes to shoot her pictures again four decades after her most recent concert in the city, according to The Bangor Daily News here). Her Cleveland engagement on Friday night at the sold out 2,200-seat Hard Rock Casino won universal praise from the media including The Cleveland Scene here, Neo Music Scene here and The Cleveland Plain Dealer here. Look for your official Dollymania.net galleries over the next few days such as the shot to the right (click on it for a larger view). Photograph is copyright � 2016 T. Duane Gordon/Dollymania.net. All rights reserved. May not be reproduced or used without prior written consent. Click on the tumbnails for a larger view. Emmylou Harris' Original Album Series, Volume 1 (with two Dolly covers, one track with Dolly harmony and one track with Trio harmony by Dolly and Linda Ronstadt) gains four places to No. 16 on this week's U.K. country compilation albums tally, it was revealed Friday, and her Original Album Series, Vol. 2 (featuring one track with Dolly harmony and two tracks with Trio harmony) falls back out of the top 20, down from No. 15, while Ronstadt's own Original Album Series (featuring one Dolly cover and one track with Dolly harmony) loses seven on the same chart to No. 20. Dolly's Pure & Simple Tour continues to roll across the continent. Fans packed a sold out Wolf Trap outside of D.C. on Wednesday night, following Tuesday's show in Charleston, W.V., which was covered by WSAZ here and WVAH here. One new Canadian show, Sept. 12 at the MTS Center in Winnipeg, Man., was announced on Wednesday, although ticket information was not yet available. The tour next heads to Cleveland Friday, Cincinnati Saturday and Lewiston, N.Y., on Sunday. Although news of its release was first reported by Dollymania.net more than a month ago, Penguin Young Readers on Thursday officially announced the Oct. 18 release of a new children's book version of Dolly's song Coat Of Many Colors. As was previously reported, the book will feature illustrations by Brooke Boynton Hughes (Dolly originally released a children's book version of the song with illustrations by Judith Sutton through publisher Harper Collins in 1994). The only new information in the announcement was that the book will come with access to a new downloadable song by Dolly called "Making Fun Ain't Funny." 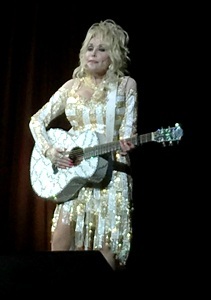 In the release, Dolly stated: "Every year I receive dozens of letters and emails from teachers talking about how they use the song ('Coat of Many Colors') in their classroom to discuss being proud of who you are, that being different is not a bad thing, that every person is special and the terrible consequences of being bullied. It has always made me feel honored that my little song has been used in this way." She added about the experience upon which the autobiographical song was based: "I carried the hurt from that day for a long time before it all finally came together in one frantic moment. The words just poured out of me. Of course, over all of these years my memories are all about so many people who have shared with me how this song helped them heal a similar hurt. I can see all of their faces and remember all of their words." Get your copy here. Don't forget that Dolly's donated pair of personal shoes to benefit Soles4Souls, a Nashville charity that distributes new shoes to children in need ends at 6 p.m. Eastern Friday. The autographed Sam Edelman shoes, each of which is individually signed by Dolly along with an autographed shoebox, autographed image of Dolly wearing the shoes, and autographed headshot photo, are on ebay here. As of press time, 21 bids had been submitted and the price stood at $1,775. Dolly gave her longest set list of the Pure & Simple Tour Tuesday night in Charleston, W.V., according to attendees. The show included "Applejack," which she performed in Atlanta and Greenville but not in Greensboro, as well as "Precious Memories" and "Hello God/He's Alive," which she had performed in Greensboro and Atlanta but not Greenville. The tour now moves to Wolf Trap outside of D.C. on Wednesday, the Cleveland area on Friday and Cincinnati on Saturday. For those in the Cinci area, wine bar Unwind has scheduled a Dolly party the evening of the 9 p.m. concert with a 5 p.m. to 7 p.m. event featuring Dolly music, Dolly decorations and a special Dolly-inspired bar menu. The Facebook event page is here. (Your webmaster intends to be at the party and the concert if you want to say hi!) Meanwhile, Dolly on Tuesday celebrated the tour's first few shows' success with a statement on her official website here: "It is fun being on the road again. I've been at it a long time. I appreciate you for allowing that to happen." The Tennessean is taking votes to choose country music's all-time best song in its "Country Music Madness" contest for the CMA Fest. Dolly's "Coat Of Many Colors" has remained in competition now in the fourth round of voting, going head-to-head this week with Tammy Wynette's "Stand By Your Man." Cast your ballot through noon Thursday here. Thanks to a request from a 16-year-old girl from Dolly's hometown, Miss Outstanding Teen Tennessee 2016 Leah Grace Humble, Dolly has donated a pair of personal shoes to a Nashville charity that distributes new shoes to children in need. The autographed Sam Edelman shoes, each of which is individually signed by Dolly along with an autographed shoebox, autographed image of Dolly wearing the shoes, and autographed headshot photo, are available through 6 p.m. Eastern Friday on ebay here. As of press time, the bids were at $1,025. Auction proceeds benefit Soles4Souls. Check out the news article about the auction here. Dolly's Pigeon Forge concert on her Pure & Simple Tour on Nov. 15 will feature Imagination Library sponsorships at $5,000 each available via e-mail here to feature up-close seats and a meet-and-greet photo with Dolly. As was previously reported here, tickets ($25, $50 and $75) go on sale to Dollywood season passholders on June 15 and the general public July 1. Seats will be sold online here or by calling 1-800-Dollywood. All proceeds from the concert benefit Dolly's early childhood literacy program. Special lodging packages at the park's DreamMore Resort will also be offered. In related news, Banks News Today had a review Monday of her Atlanta-area stop on the tour. Read it here. "Quite possibly the best fan gift we have ever gotten!" the Dixie Chicks declared on their Facebook page here at the band's Chicago show and in the photo below as they posed with colorful shirts bearing one of Andy Warhol's Dolly paintings on each. Dolly's Pure & Simple Tour's first three sold out nights have started receiving reviews, and they are stellar. Check out coverage of Friday's Greensboro show from Journal Now here and Saturday's Atlanta-area engagement from Time Warner Cable News here and The Atlanta Journal-Constitution here. I'm told the set list for Atlanta was the same as the tour opener in North Carolina with the exception of the addition of "Applejack" to the set list before "Rocky Top." Then on Sunday in Greenville, S.C., she deleted "Precious Memories" and "Hello God/He's Alive" from the set list. The tour now runs to Charleston, W.V., on Tuesday and the D.C.-area on Wednesday. A fan has uploaded all of Dolly's Home & Family performances from last week's episodes of the Hallmark Channel's program at Dollywood to YouTube. Check out the playlist here. Dolly opened her Pure & Simple Tour Friday night in Greensboro, N.C., electrifying the crowd, according to fans reporting afterward. In advance of the show, CNN shared a new quote from her about the state's anti-gay and anti-trans laws that have caused most LGBT-friendly artists who were booked to perform in the state in recent months to either cancel their shows or donate all proceeds to LGBT charities, saying according to WATE here: "I think everybody should be treated with respect. I don't judge people. I try not to get too caught up in the controversy of things. I hope that everybody gets a chance to be who and what they are. I just know if i have to pee, I'm going to pee. I don't care where it's going to be." At the end of her actual concert, she addressed the issue from the stage, introducing her encore of "I Will Always Love You" with the statement: "I've always loved all my fans. In fact I really have all kinds of people that work in my organization. I don't care what you're black or white or green or blue or alien gray. I don't care if you're gay or straight or transgender. I love you, all of you. And I'd like to think that God loves us all. We need to try to learn to live a little better, love a little more." Thanks to Anthony Favale for the set list below and photos from the show at left and right! Logo on Friday started promoting Dolly's appearance on Sunday's season premiere of Cocktails & Classics to screen 9 To 5 with a video clip here. Emmylou Harris' Original Album Series, Volume 1 (with two Dolly covers, one track with Dolly harmony and one track with Trio harmony by Dolly and Linda Ronstadt) dips five spots to No. 20 on this week's U.K. country compilation albums tally, it was revealed Friday, and her Original Album Series, Vol. 2 (featuring one track with Dolly harmony and two tracks with Trio harmony) re-enters the top 20 at No. 15, while Ronstadt's own Original Album Series (featuring one Dolly cover and one track with Dolly harmony) inches up one on the same chart to No. 13. Fundraising group the Great Smoky Mountains Association on Thursday revealed Dolly is among the artists who contributed new covers of classic Smoky Mountain songs for the new Appalachian music album On Top Of Old Smoky: New Old-Time Smoky Mountain Music, coming out Aug. 21. 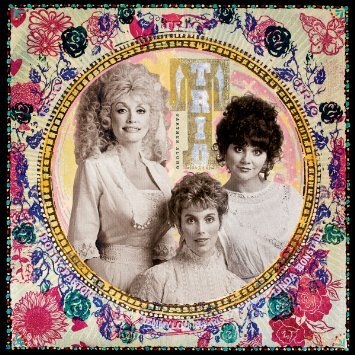 Dolly chose to record "Rosewood Casket," the definitive modern recording of which she had also sung lead on back in 1987 from the Trio project with Linda Ronstadt and Emmylou Harris. Her new version, which you may listen to via Soundcloud here or in the media player above, is a solo recording. As Dolly's Pure & Simple Tour kicks off Friday night in Greensboro, N.C., two new dates were announced Thursday for the later legs of the tour: July 30 at the Scottrade Center in St. Louis, Mo., and Aug. 13 at the Verizon Arena in North Little Rock, Ark. VIP seats for both shows go on sale at 10 a.m. Central Friday, with Scottrade Center Insider and Ticketmaster presales for St. Louis and In The Know and radio presales for Arkansas beginning at the same time. Public sales for both dates start at 10 a.m. Monday via Ticketmaster. In related news, promoting the tour Dolly sat down with CNBC for an interview for its CNBC Meets segment with several clips available online here, here and here. She also spoke with Variety here about her career, noting she hopes to have her Broadway musical based on her life on the stage in about two years, and talked with CMT about life on her bus here. Logo has announced that Dolly's appearance on the network's Cocktails & Classics for their screening of her classic 9 To 5 will be the premiere of the show's third season at 8 p.m. this Sunday with repeats at 11 p.m. Sunday and 8 p.m. and 11 p.m. Thursday. Dolly recently recorded a promotional video for Visit My Smokies, which was posted to Facebook here this week. The sequel to Dolly Parton's Coat Of Many Colors gets a preview in an interview with star Alyvia Alyn Lind from The Knoxville News-Sentinel here. After 34 weeks on the chart, the June 11 Billboard tally released Tuesday showed Don Henley's Cass County, featuring the Dolly duet "When I Stop Dreaming," falls off the top 50 country albums this week, down from No. 46.